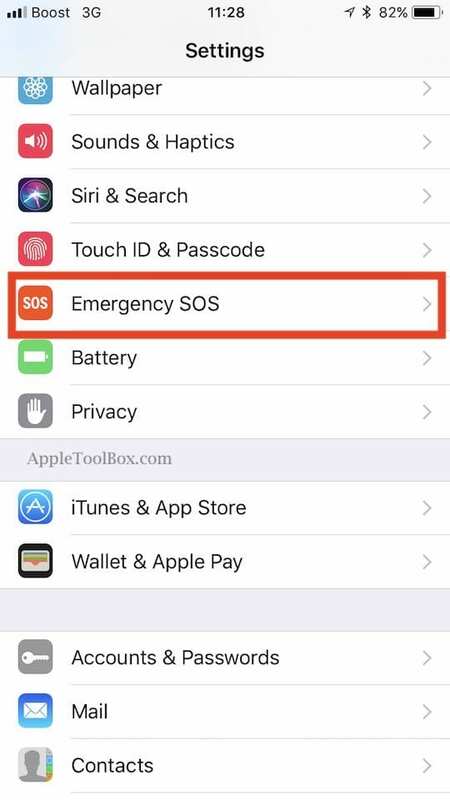 Apple has finally delivered the SOS Emergency feature to all iPhone users that are using iOS 11 on their device. Before iOS 11, Apple offered this feature only in limited geographies. Apple has been bolstering up this feature across its device ecosystem via various patents for quite some time. This offering is another safety oriented feature that Apple has introduced apart from the Do Not Disturb While Driving”. 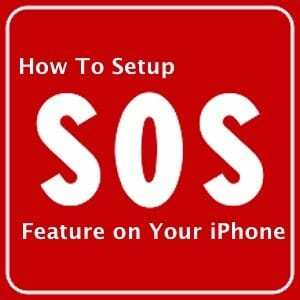 In this short article, we show you how to set up and use the new SOS Emergency feature on your iPhone. 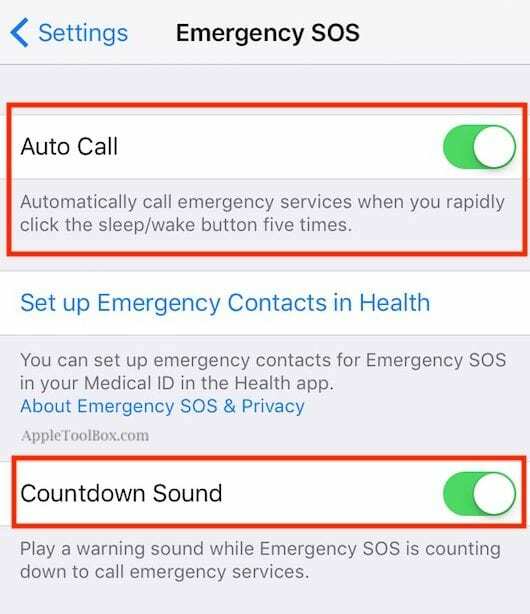 This setting makes your iPhone automatically call emergency services when you click the sleep/wake button five times in a row. 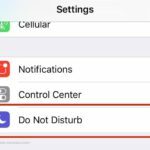 For folks using iPhone 8 models or iPhone X, the shortcut for emergency auto-calling is a bit different. Instead of tapping the Side button 5Xs, you press the Volume Up OR Down button AND the Side button at the same time. 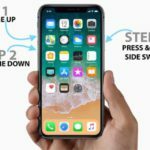 If this action sounds familiar, it is the same stroke used on iPhone 7 models to perform a forced restart–yeah, it’s complicated! To avoid accidentally calling the emergency services, You can enable the Countdown Sound feature as well. 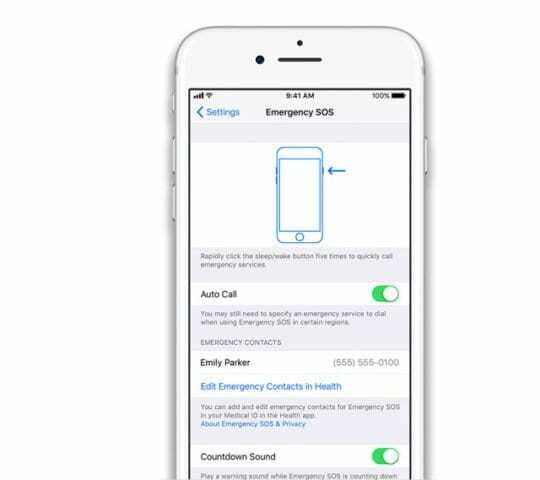 This feature makes sure that your iPhone plays a warning sound while its counting down to call 911. If you haven’t updated your iOS to iOS 12 or higher, consider doing so. 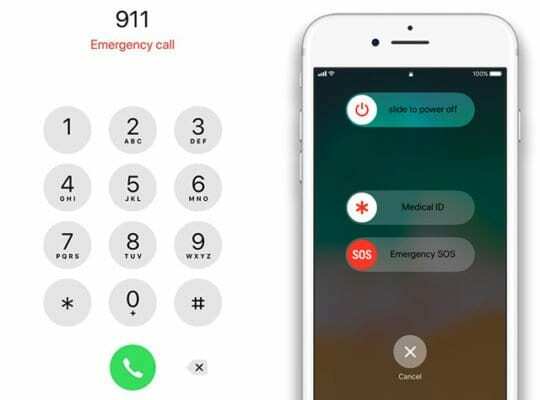 With iOS 12 and higher, you no longer have to know your exact location when calling 911 in the US. During emergency calls only, iOS 12 sends your exact location data to first responders. 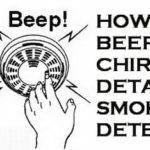 It’s an effort to reduce response time and get care sooner. 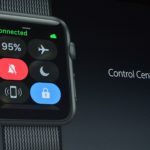 Apple uses a technology it calls HELO (Hybridized Emergency.) It’s a combination of cell towers and on-device data sources like GPS, and WiFi Access Points that help to identify a 911 caller’s location. While you are exploring this new Emergency SOS feature settings on your iPhone, we urge you to review the emergency contacts that you have set up in the health app and make sure that it is up to date. To review your emergency contacts, tap on ‘Set up Emergency Contacts in Health”. This feature updates your contact records associated with your medical id. 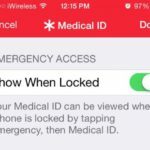 If you have not set up the Medical ID on your iPhone, we recommend that you look at our detailed article here. 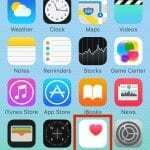 The other important element that needs reviewing is for users that use their Apple Watch along with their Apple iPhone. Since the Watch also features an Emergency SOS service, review its settings and ensure that they align with your iPhone settings. We hope that you take time to explore the Emergency SOS feature on your iPhone. And that you set it up for those situations when you need it the most. We also recommend that you take time to set up the Medical ID features on the health app as they come in real handy to folks that provide you with EMS services. Forced Restart Not Working on iPhone 8 or iPhone X? SOS automatically calls the local emergency services automatically–you can’t change that. 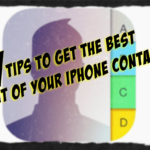 However, you can add emergency contacts. After an emergency call ends, your iPhone alerts your emergency contacts with a text message and sends those contacts your current location, and sends updates to your emergency contacts when your location changes for sometime after that emergency call ends.